This screening is subtitled for The Hard Of Hearing. 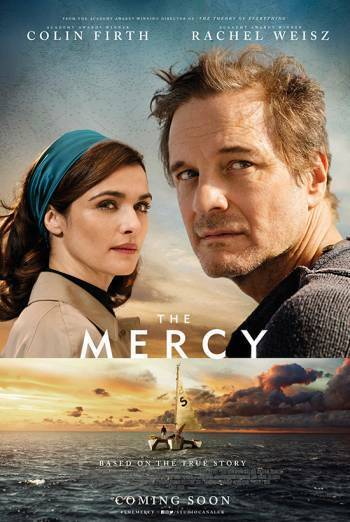 Oscar winners Colin Firth (The King’s Speech), Rachel Weisz (The Constant Gardener) and James Marsh (Man on Wire, The Theory of Everything) team up for The Mercy, a maritime biopic based on the haunting true story of British businessman and amateur sailor Donald Crowhurst. 1968: Crowhurst (Firth) enters the Sunday Times Golden Globe Race, the first non-stop, single-handed, round-the-world yacht race. Hoping to publicise a new navigation device he’s created, he also needs the cash prize to salve his ailing business. So, leaving his wife Clare (Rachel Weisz) and children behind, he takes to his untested trimaran and sets off on a mission to circumnavigate the globe. But his inexperience and the intense loneliness of the experience make for disastrous and dramatic struggles on the high seas, and press him to consider falsifying his progress; while back in England, his family eagerly awaits his return. Marsh’s biopic promises complex, expressive performances from Firth and Weisz, ably supported by the likes of Ken Stott and David Thewlis. It’s a tale of ambition, adventure, madness and tragedy elucidating the life of a man who remains a quixotic and mysterious figure in British history – his deepest motivations still unknown. Supported by BFI FAN: Film Audience Network with funding through The National Lottery.